I’ve noticed a growing swell of first- and second-generation immigrant writers of fantasy expressing anxiety over drawing on their family’s culture for their work, or the consequences they face when they don’t. The fears are the same: getting criticism for lack of authenticity – not being a “real” member of that culture – or getting pigeonholed and then ostracized for not reflecting the dominant narrative of “the immigrant.” These fears reflect our own destabilized experiences as liminal cultural actors. We appear steeped in a culture but not in a geography, not quite of the place your family came from but not quite of the place you are, either, and with that lack of belonging comes an internalized sense of inevitable rejection from both places. I wrote a long time ago about how having a liminal identity can go hand in hand with the desire to write fantasy and science fiction, but I didn’t touch on how carving that space carries its own implicit dangers. Immigrants become scared of casting an already contested identity out into the world; if you don’t conform to certain set boundaries set by others without your experience, you can face backlash. On the one hand, you wrote your family’s culture and language wrong because you aren’t a true part of that culture and language. You didn’t grow up there. Or you left. On the other, you wrote someone else’s culture wrong because you didn’t base your stories on the culture that’s also “yours.” You are an outsider, stay with what you know. And let’s say you do that; well, those without any connection to your family’s culture will still find ways to point out how you did it wrong, because you didn’t stick to the story they’ve constructed about you. Every choice is a mistake, every attempt to express and navigate your identity in writing isn’t the “right” way. I have no easy response to any of these anxieties. They are just a part of being an immigrant, along with so many others. You can’t know how your writing will be reflected back on you, but where else to work out these contradictions, than in the imaginative space? Martha Wells has a talent for crafting a perfect first paragraph. A reflection on the life and works of Ursula K. Le Guin in light of her recent passing. In which we speak of books we never finished, or wish we had never finished. Normally, I would provide a list of the novels we talked about. But this time, I think it’s better if you go in blind. The Giver by Lois Lowry is the one book on elementary/high school reading lists that Canadians our age remember fondly. Why is this, and why is the cover so darn memorable? 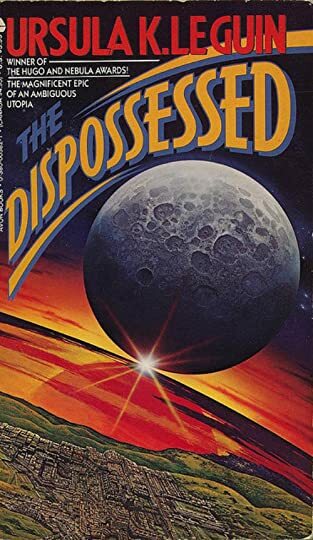 We egoize about Ursula K. Le Guin’s 1974 classic, The Dispossessed. I was browsing the British Library’s Flickr photostream, of all places, when I stumbled across a full PDF scan of the 1895 novel Fifteen Hundred Miles and Hour by Charles Dixon. The title refers to the speed of a spaceship built by a Dr. Hermann which ends up transporting him and three other stalwart individuals, as well as a dog, from England to the planet Mars. Keep in mind, The War of the Worlds wasn’t serialized until 1897. Here we have another example of early scientific romance that I think only Darko Suvin has read cover-to-cover after it went out of print.